"Ys II" redirects here. For the anime, see Ys (anime). Ys II: Ancient Ys Vanished - The Final Chapter (イースII, Īsu Tsū) is an action role-playing video game developed by Nihon Falcom, and first released on June 24, 1988 for the PC-8801 and PC-9801. 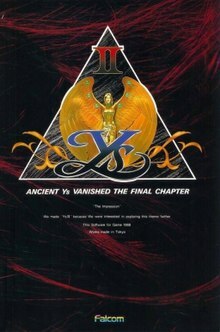 It is the sequel to Ys I: Ancient Ys Vanished, and takes place immediately following the end of the first game. The game has received a very large number of ports and remakes over the years. It was later adapted into the anime Ys II: Castle in the Heavens (1992). Like its predecessor, Ys II was ported to various other platforms following its first release, such as the FM-7, X1, MSX2, and Famicom. It was released along with its predecessor as part of the enhanced compilation, Ys I & II, for the TurboGrafx-CD by Hudson Soft in 1989. For many years this was the only version of Ys II that received an official English release. An MS-DOS remake called Ys II Special, developed by Mantra, was released exclusively for the South Korean market in 1994. It was a mash-up of Ys II with the anime Ys II: Castle in the Heavens (1992) along with a large amount of new content, including more secrets than any other version of the game. The game was a success in Korea, despite competition from the Korean RPG Astonishia Story that same year. Years later, a third remake was released for Microsoft Windows-based PCs as Ys II Eternal, and later as Ys II Complete. Versions of the game have also been developed for mobile phone platforms. Ys II was also remade in 2008 for the Nintendo DS. An English translation of this version was released by Atlus in North America, along with the DS version of Ys I on a single card, as Legacy of Ys: Books I & II in 2009. The Japanese version had been released as a single game when it came out in 2008. Ys II picks up immediately where Ys I left off. Adol Christin is transported to the floating island of Ys, where he meets a young woman named Lilia. She takes Adol to her home, Lance Village. It is here that he will begin his quest to unravel the secrets of Ys, and finally, rid it and Esteria of evil. Also returning from the first game is the 'bump' combat system. The player attacks enemies by running into them, and the enemy takes damage according to Adol's stats, the enemy's stats, Adol's position, and the enemy's position. A new addition to Ys II is the magic system: Adol can acquire several different spells he can use throughout the course of play, such as a fire spell for attack and a time spell which can stop enemies as long as it is active. The use of magic consumes Adol's MP stat. Another major change in combat in this game compared to the previous game is that the bump combat system cannot be used against most bosses. Crashing into all but two of the bosses in this game in an attempt to damage them will only result in Adol taking damage. These bosses must be defeated with the fire spell. The soundtrack to Ys II was composed by Yuzo Koshiro, Mieko Ishikawa, and Hideya Nagata. Music from Ys II (1988): Contains the soundtrack to the original PC-8801 edition of Ys II, along with four Ys II tracks arranged by Hiroyuki Namba and one vocal track. Perfect Collection Ys II (1990): A two-CD set, the first of which is a complete arrangement of the Ys II soundtrack by Ryo Yonemitsu. The second disc contains assorted arrangements from Ys I, II and III. Music from Ys II Renewal (1995): The entire Ys II soundtrack, reproduced on more advanced synthesizer equipment. Japanese game magazine Famitsu gave the Famicom (NES) version a score of 27 out of 40. Famitsu gave the PCE-CD (TurboGrafx-CD) version a score of 35 out of 40. ^ a b "イース I・II [PCエンジン] / ファミ通.com". www.famitsu.com. Retrieved 2018-07-24. ^ "イースII DS [DS] / ファミ通.com". www.famitsu.com. Retrieved 2018-07-24. ^ "イースII [ファミコン] / ファミ通.com". www.famitsu.com. Retrieved 2018-07-24. This page was last edited on 28 March 2019, at 23:39 (UTC).